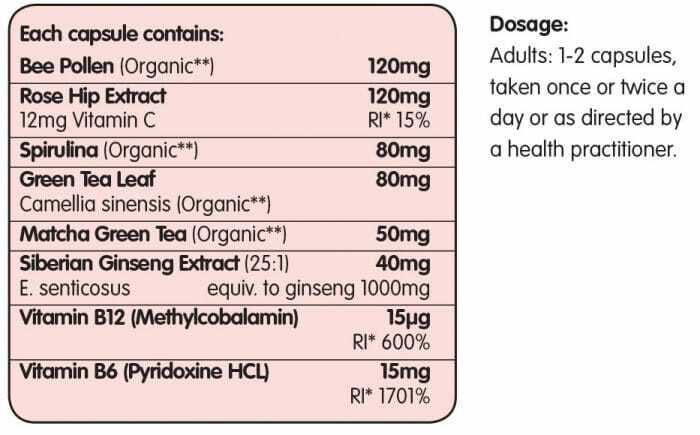 This all in one synergistic formula combines nutrient rich ingredients with a proven history of benefits when it comes to supporting energy & focus. 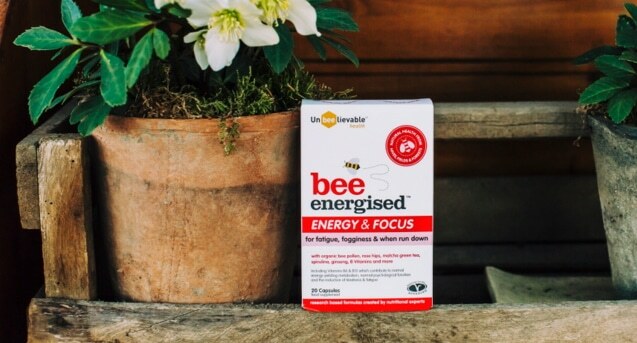 Researched and created by nutritional experts, Bee Energised combines highest quality organic Bee pollen, organic matcha tea, organic spirulina, siberian ginseng, organic green tea leaf, & rose hips along with Vitamin B6 & Vitamin B12 (which contribute to normal energy yielding metabolism- reducing feelings of tiredness and fatigue), providing you with the mental and physical support to help maintain a steady stream of energy, stamina, concentration levels and mental alertness throughout your day, without the jitters and crashes. Benefits build with time to help resolve ongoing issues of fatigue & lethargy. Increases mental clarity and alertness in your daily activities. Ideal for those looking to improve and enhance focus.